One of the things that holds a lot of people back from lifting heavier is a weak grip. While you should definitely be doing grip exercises as part of your workout, your grip strength may never get to the level of the rest of your body. A simple solution for this is to use weight lifting hooks to improve grip so you can lift heavier. What Are Weight Lifting Hooks? 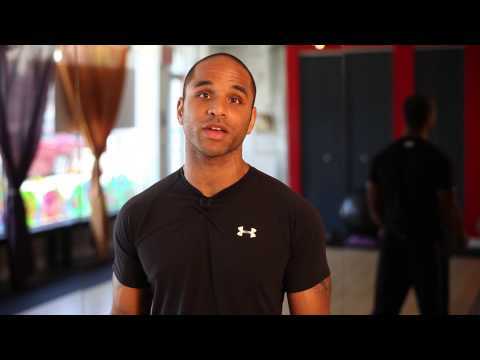 Why Use Weight Lifting Hooks? These weight lifting hooks are different than most. They were designed so they can be used as an alternative to lifting straps. However, the weight lifting hooks are also reversible so can they can be used as a glove. As far as comfort goes, the Cobra Grips are well made. There is an interior foam pad so your wrists don’t come in contact with the closures. You won’t feel any digging into your skin. There is some padding on the hook itself, which can feel weird at first. The hook does hold contact very well, but it would be nice if were a bit longer to wrap around the bar better. The Cobra Grips don’t list a weight rating. 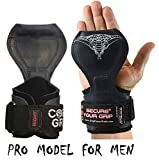 On their website, they just say that the grips can support “as much weight as you can lift.” People report doing over 600lbs with them without bending or tearing, so they seem to be rated for heavy weights. Tip: Don’t get the light-colored Cobra Grips. They get dirty really quickly and you’ll be constantly washing the grips. These weight lifting hooks cost a bit more, but the price is reflected in the quality. The materials hold up really well. Even the padding on the steel hook doesn’t wear down with heavy use, so the hooks remain comfortable. The Pro lifting hooks would be the best if they only had adjustable hook lengths. Now, you can’t move the hook further or closer to your palm, so they might be uncomfortable for some hand sizes. 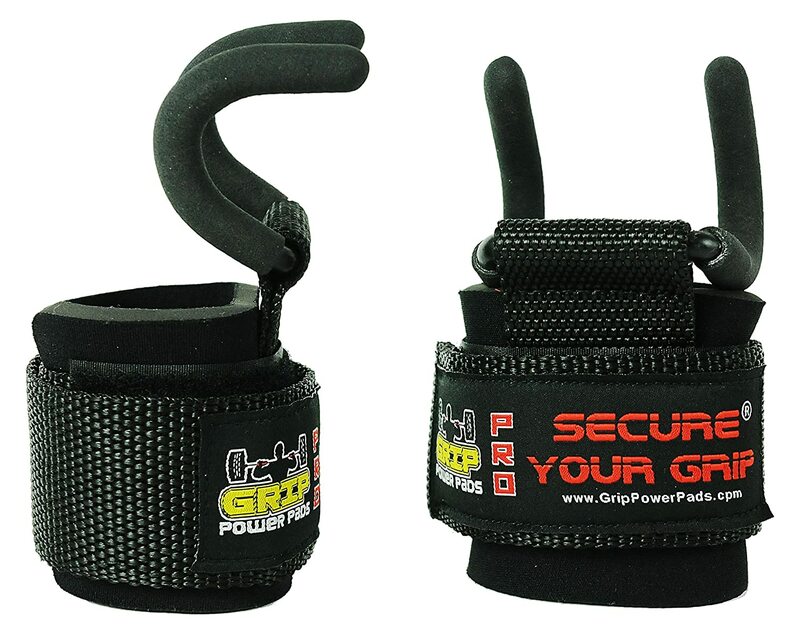 Also made by Grip Power Pads, this lifting hook uses the same wrist straps as the Pro hook from above. So, it is comfortable and gives good support. The difference is that this hook uses the prong shape. I personally prefer a solid hook construction over prongs. However, prongs can be a lot better for doing dumbbell exercises as opposed to bar exercises. Don’t let the cheap price of these lifting hooks deter you. The hooks are actually really well designed, particularly because you can adjust the position of the hooks based on your hand size. The hook position is also reversible, making these great for exercises like deadlifts. The reason the lifting hooks are so cheap is that they aren’t built for heavy weights. You can go to about 300 with these hooks (combined rating). After that, the hooks will likely bend and the coating wear off. 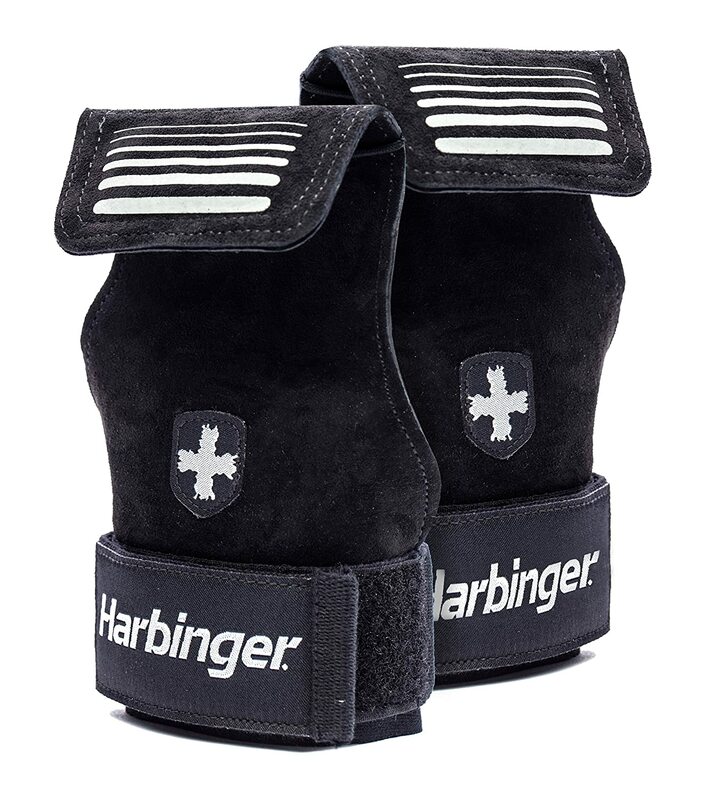 Like the Cobra Grips (#1), these Harbinger grips are a cross between lifting hooks and gloves. The difference with the Harbinger grips is that they use a “patented Bioform” hook to wrap around the bar. The hook surprisingly holds its shape really well. In fact, it can hold the form too well at times. For example, if the hooks are in the wrong direction for a long time, it will take some time before they “remember” a new direction. Harbinger generally makes really good products, and these hooks are no different. The materials are all quality and hold up well. I just wish that the hook position could be adjusted. People with small wrists and large hands might find the grips don’t fit well. 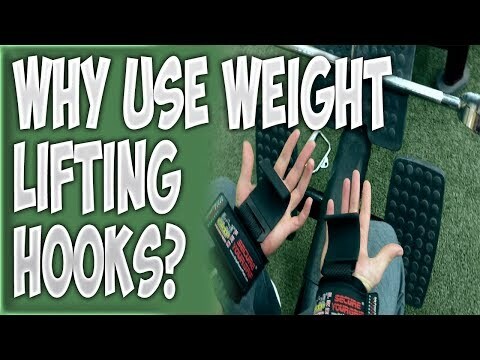 These last weight lifting hooks I’d only recommend for people with larger hands who need to lift heavy loads. Rated at 600lbs, the lifting hooks are well-made and don’t start to bend or warp. 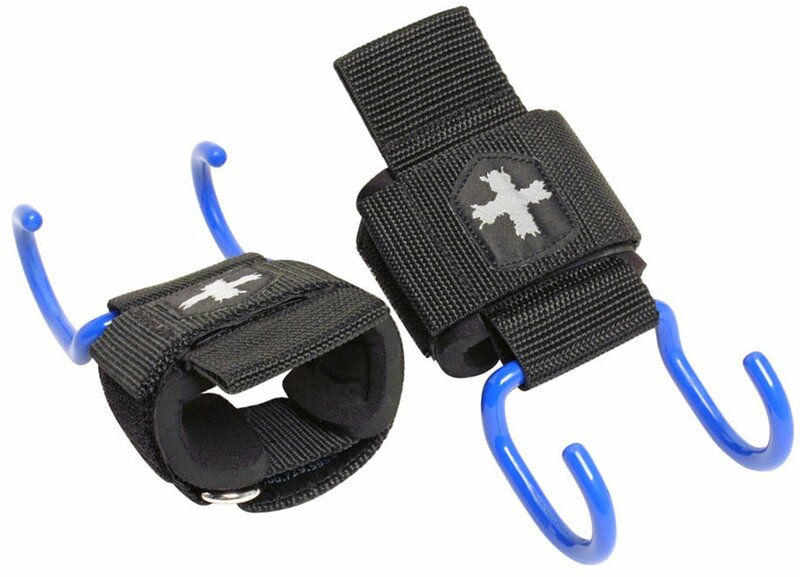 The wrist straps are also durable and feel secure on your wrist. The only issue is if you have small wrists. Then you might not be able to tighten then amount for support. The major downsides of the weight lifting hooks are that the hook position isn’t adjustable. Also that the hook is a bit large at 2 5/8 inches. They’ll fit around most larger bars, but you’ll feel like your hands are too far open. A weight lifting hook is basically a sturdy wrist strap that is attached to a metal hook. You position the hook in your hand. The hook holds the weight, reducing the amount of grip strength you need. You’ll still need some grip strength when using lifting hooks though. If you were to completely relax your grip, the straps would pull really hard and cut into your skin. Grip is usually one of the weak points that lifters have. When grip fatigue sets in, it often results in poor form. By using weight lifting grips, you’ll delay fatigue so you can focus on form and lifting to your fullest potential. DO NOT use lifting hooks for hanging on bars! The downward pull on your wrists can cause problems. Straps are one of the most important pieces of workout gear. 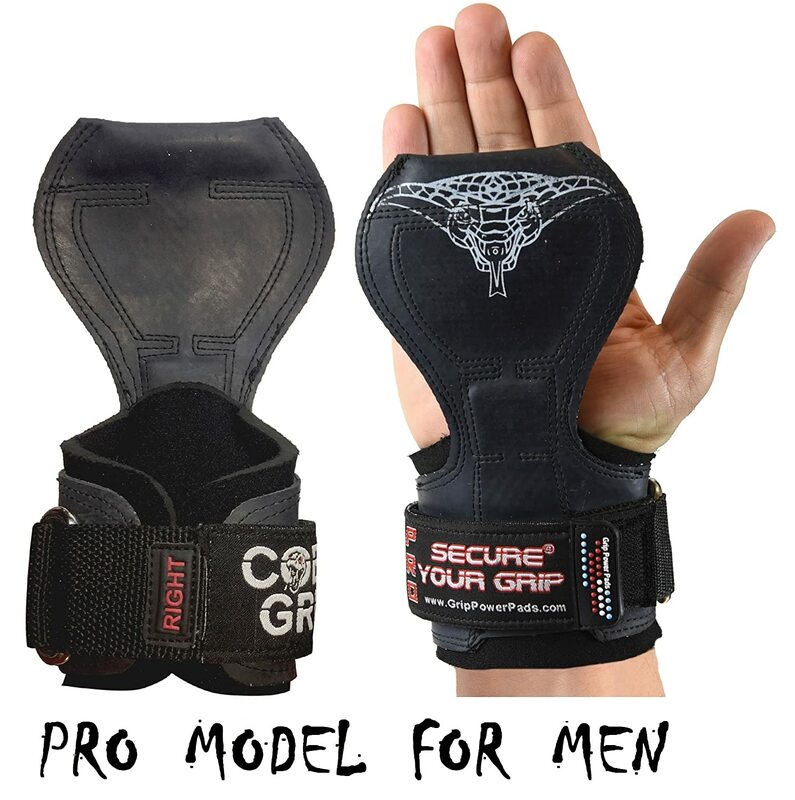 They help keep the hands in place, thus improving grip. The tensile strength provided by the straps also directly assist your grip. However, some lifters need more grip support that straps can offer. That’s why many pro lifters prefer hooks over straps. Straps typically put weight on your wrist. By comparison, a good pair of weight lifting hooks will shift the weight from your wrist to the base of your hand. 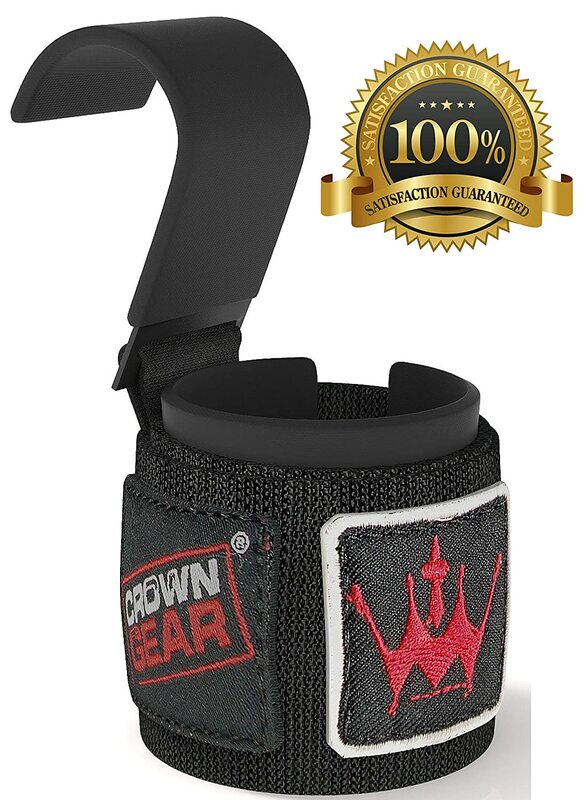 The company Cobra Grips goes as far as saying that weight lifting straps can cause nerve damage, carpal tunnel, and vesicular damage because of the pressure on the wrists. There are a lot of really bad, cheap weight lifting hooks out there. 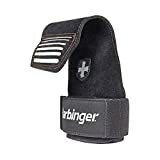 If you want to get a quality product which suits your lifting needs and is comfortable for your wrist/hand size, you’ve got to know what to look for. Prongs: These fit well on dumbbells with convex bars. I personally find them uncomfortable to hold beneath my fingers on straight bars though. Solid Hook: These have a J-shaped hook that is solid through. Look for ones with durable padding and these will be very comfortable. Glove-Hook Combos: Some lifting hooks can be reversed. In the reverse position, they act as gloves while still providing grip support. Flip them around and they act as standard hooks. These tend not to be as strong as solid hooks though. All “glove-hook” style grips will be reversible. Occasionally, you’ll find standard lifting hooks that can be reversed. This is really useful for doing deadlifts with your hooks. 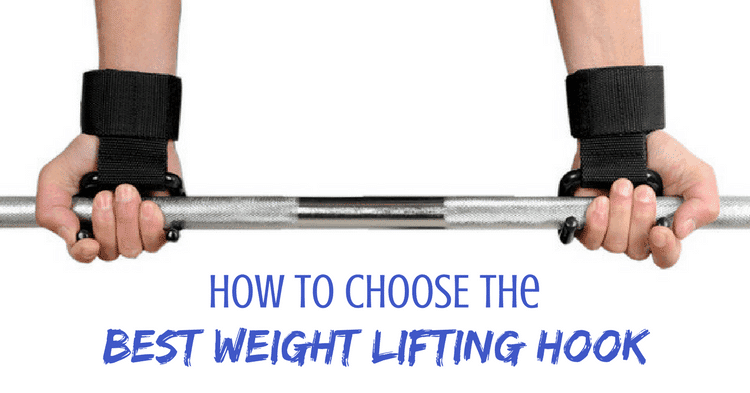 This is one of the most important features, but only a few of the very best weight lifting hooks have it. With these hooks, a separate Velcro strap is used to attach the hook in place. The Velcro can be moved so the hook can go further or closer to your wrist. If you have small hands or your hands don’t match your wrist size (such as small wrists and big hands), then you must get this feature. Otherwise, the hook will be in the wrong position (and thus useless to you). The only downside with adjustable hook position is that they are bulkier because of the extra strap. Pretty much all weight lifting hooks say they are “fully adjustable.” If you have large or small wrists though, it is best to look for hooks which actually come in sizes. They’ll close more securely on your wrists. Lifting hooks which come in sizes will also usually adjust the hook position accordingly. For example, a “small” size will position the hook closer to the wrist strap, whereas “large” sizes will have hooks further from the wrist. It is rather annoying that many weight lifting hook manufacturers don’t list their pull rating. The lifting hooks reviewed here are all good for up to 300lbs. Very cheap lifting hooks might start warping and bending at 100lbs. Never use a warped lifting hook. It can cause strain on your wrists! If you are looking for a cheap lifting hook for loads under 300lbs, the Harbinger lifting hook is ideal. It is comfortable and the hook position is actually adjustable. 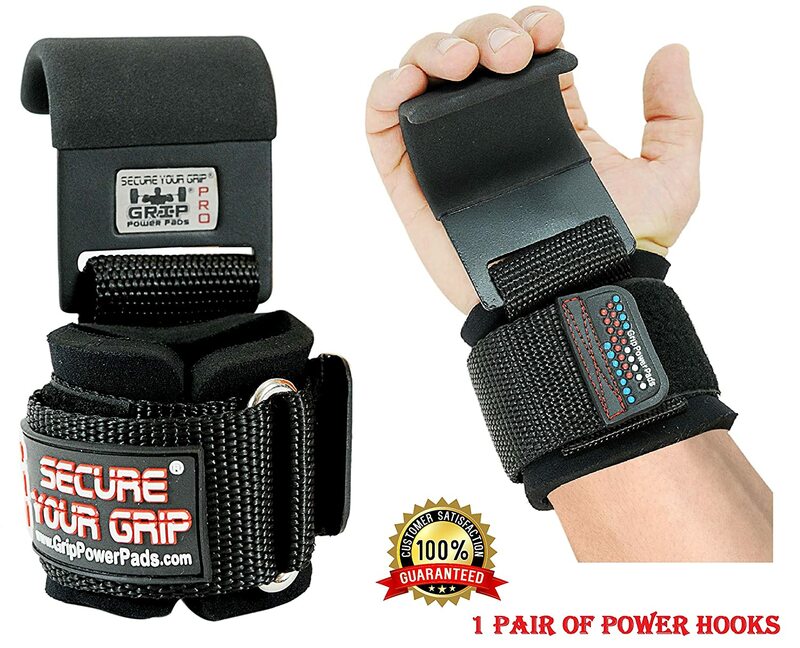 Otherwise, I’d go with the Grip Power Pads Pro lifting hooks. Rated at 600lbs and made from quality materials, they hold up even during intense lifting sessions.